Adds 30+ fruits and veggies to leveled lists. More food for you to eat! 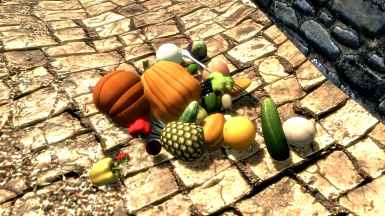 This mod adds over 30 new fruits and vegetables to food leveled lists. As of 1.1 it requires Hearthfire, but also adds recipes for new pies and dumplings at the HF ovens and Leveled Lists. I recommend using a bashed, smashed, or merged patch if you have other mods that edit the food and food barrel leveled lists. Version 1.1 also has a compatibility patch for Realistic Needs and Diseases.